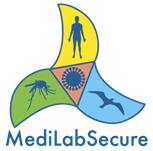 During the 4 and a half years of the project MediLabSecure, many events have taken and will take place: meetings with partners, as well as workshops & trainings. Reports, participants' lists, course materials, etc are available in the Private Area for members. Moreover, other activities have been carried out, such as External Quality Assessments, Site Visits, the MeSA study and many project dissemination activities such as participation to international events with oral and poster communications as well as scientific publications.